What can we say about Paris, if you have never visited then you have missed out on a great cultural treat, a beautiful City with wide avenues. This is where Valentina Brattisani was born in 1870. In 1870 there was a great siege taking place. A siege which perhaps was why Giuseppe Brattisani left his home there to head for the Scottish Capital. 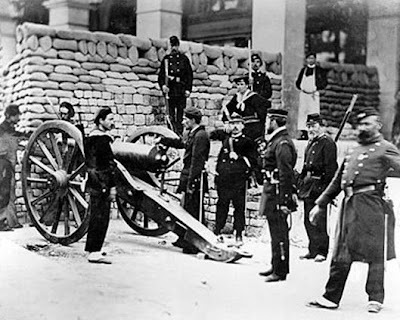 The Siege of Paris, lasting from September 19, 1870 – January 28, 1871, and the consequent capture of the city by Prussian forces led to French defeat in the Franco-Prussian War and the establishment of the German Empire as well as the Paris Commune. e German armies quickly reached Pa ris, and on September 15 Moltke issued orders for the investment of the city. Crown Prince Albert’s army closed in on Paris from the north unopposed, while Crown Prince Frederick moved in from the south. On September 17 a force under Vinoy attacked Frederick’s army near Villeneuve Saint Georges in an effort to save a supply depot there and were eventually driven back by artillery fire. The railroad to Orléans was cut and on the 18th Versailles was taken, which would then serve as the 3rd Army’s and eventually Wilhelm’s headquarters. By September 19 the encirclement was complete and the siege officially began.
. A Christmas menu, 99th day of the siege. Unusual dishes include stuffed donkey’s head, elephant consommé, roast camel,kangaroo stew, antelope terrine, bear ribs, cat with rats, and wolf haunch in deer sauce. The Prussians had secured their victory in the Franco-Prussian War. On January 18, 1871 at Versailles Wilhelm I was proclaimed German Emperor. The kingdoms of Bavaria, Württemberg, Saxony, the states of Baden and Hesse, and the free cities of Hamburg and Bremen were unified with the North German Confederation to create the German Empire. The preliminary peace treaty was signed at Versailles and the final peace treaty was signed with the Treaty of Frankfurt on May 10, 1871. Otto von Bismarck was able to secure Alsace-Lorraine from France as part of the German Empire under the Treaty of Frankfurt. Another stipulation of the treaties was a German garrison to be left in Paris. This angered bitter Paris residents at the continued presence of German troops in the wake of defeat. Further resentment arose against the current French government and from April-May 1871 Paris workers and National Guards rebelled and established the Paris Commune. On March 18th, 1871, when Thiers tries to regain power over the Paris workers violently, the soldiers were overcome by the women of the working class, and refused to fire on the Parisians. Soldiers and workers fraternized. When popular resistance broke out and spread among the working classes all over Paris, class war took place. This is where the film La Commune begins .French workers took control of the factories, setup barricades throughout Paris to block the invading army, and initiated a municipal council with a state-like structure known as the Commune. Les Miserables is perhaps the most popular musical of that period in time. 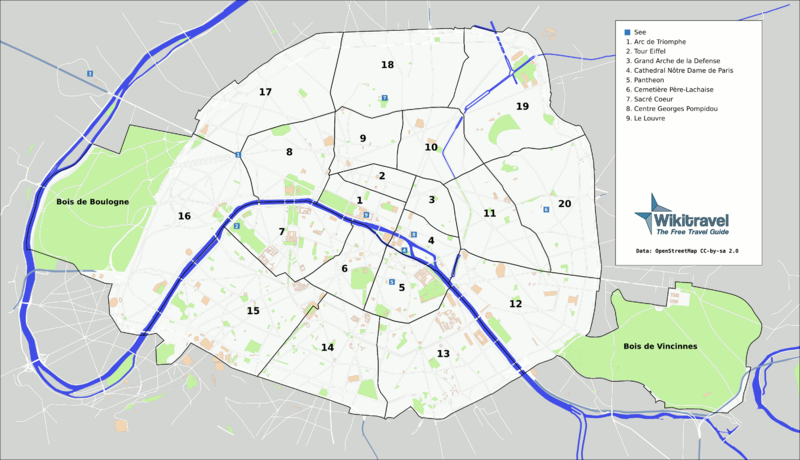 Central Paris is officially divided into 20 districts called arrondissements , numbered from 1 to 20 in a clockwise spiral from the centre of the city (known as Kilometre Zero and is located at the front of Notre Dame). Arrondissements are named according to their number. You might, for example, stay in the “5th”, which would be written as 5e (SANK-ee-emm) in French. The 12th and 16th arrondissements include large suburban parks, the Bois de Vincennes, and the Bois de Boulognerespectively. Paris started life as the Celto-Roman settlement of Lutetia on the Île de la Cité, the island in the Seine currently occupied by the Cathédral de Nôtre Dame. It takes its present name from name of the dominant Gallo-Celtic tribe in the region, the Parisii. At least that’s what the Romans called them, when they showed up in 52 BCE and established their city Lutetia on the left bank of the Seine, in what is now called the “Latin Quarter” in the 5th arrondissement. The Romans held out here for as long as anywhere else in the Western Empire, but by 508 CE they were gone, replaced by Clovis of the Franks, who is considered by the French to have been their first king. Clovis’ descendants, aka the Carolingians, held onto the expanded Lutetian state for nearly 500 years through Viking raids and other calamities, which finally resulted in a forced move by most of the population back to the islands which had been the centre of the original Celtic village. The Capetian Duke of Paris was voted to succeed the last of the Carolingians as King of France, ensuring the city a premier position in the medieval world. Over the next several centuries Paris expanded onto the right bank into what was and is still called le Marais (The Marsh). Quite a few buildings from this time can be seen in the 4th arrondissement. The medieval period also witnessed the founding of the Sorbonne. As the “University of Paris”, it became one of the most important centres for learning in Europe — if not the whole world, for several hundred years. Most of the institutions that still constitute the University are found in the 5th, and 13th arrondissements. The Paris of today was built long after the Capetian and later the Bourbon Kings of France made their mark on Paris with the Louvre and the Palais Royal, both in the 1st. In the 19th century, Baron von Hausmann set about reconstructing the city, by adding the long straight avenues and replacing many of the then existing medieval houses, with grander and more uniform buildings.New wonders arrived during La Belle Époque, as the Parisian golden age of the late 19th century is known. Gustave Eiffel’s famous tower, the first metro lines, most of the parks, and the streetlights (which are partly believed to have given the city its epithet “the city of light”) all come from this period. Another source of the epithet comes from Ville Lumière, a reference not only to the revolutionary electrical lighting system implemented in the streets of Paris, but also to the prominence and aura of Enlightenment the city gained in that era. Walking in Paris is one of the great pleasures of visiting the City of Light. It is possible to cross the entire city in only a few hours, but only if you can somehow keep yourself from stopping at numerous cafés and shops. In fact within a few years walking combined with biking and the Metro will be the only way to get around the very centre of Paris: The Mayor’s office has announced plans to declare the 1st, 2nd, 3rd, and 4th arrondissements almost totally car-free by 2012. To get a great orientation of the city on foot while seeing many of Paris’ major sights, you can do a West to East walk from the Arc de Triomphe to Ile de la Cite (Notre Dame). This walk takes about 1-2 hours without any stops. Start at the top of the Champs Elysees (at the Arc de Triomphe) and begin walking down the Champs Elysees towards Place (‘square’) de la Concorde. On the way towards the obelisk on the square, you’ll see the major stores and restaurants of Paris’ most famous avenue. Once you’ve passed the main shopping area, you’ll see the Petit Palais and the Grand Palais to your right. At Place de la Concorde, you’ll be able to see many of Paris’ major monuments around you. In front of you is the Tuileries, behind you is the Champs-Elysees and Arc de Triomphe, behind you to your right is the Tour Eiffel and Musee d’Orsay, and finally, to your left is the Madeleine. As you continue straight ahead, and out of the garden, you’ll see the pyramid entrance to the Louvre directly in front of you. The smartest travellers take advantage of the walk-ability of this city, and stay above ground as much as possible. A metro ride of less than 2 stops is probably best avoided since walking will take about the same amount of time and you’ll be able to see more of the city. You may have heard of the hazard of walking into dog droppings in Paris. The problem has receded over the last decades, partially due to fines as high as €180 and an extensive street cleaning operations. However you will still occasionally encounter one of these little packages. Eventually with a little practice you’ll be able to avoid them without effort while looking every way but down, though you may find yourself dancing around fallen leaves in the autumn (some are just the right size and colour).